I use this bottle every single morning for my shake. I love it: the metal wire ball makes sure there are no powdery lumps, the wide opening means you can easily put the sachet in the water with no spillage and the lid means you can give it a really good shake to make sure there are definitely no lumps. Lovely colour too, very happy - please make one for hot liquids too! 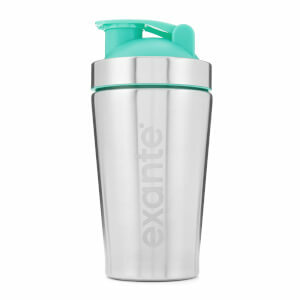 Great compact size shaker that blends the shakes up nicely. I prefer to add a little more water than recommended, a little over 300ml and the shaker still works perfectly! If you’re going to get the shakes then grab one of the shaker bottles too, handy measurements on the side and really mixes up well! Brought the shaker with orange lid and plastic insert find it better than the last one I brought with the metal ball.do u still do the plastic ones with orange lid.thanks. Great shaker, couldn't do without it for my shakes. The perfect size to pop in your bag. The wire shaker ball is brilliant for mixing the meal replacement powders. I’ve used this to mix my shakes and my soups- with cold water. I’ve never had to worry about clumps or lumps at all. All in all a really cleaver and useful shaker bottle to have at home or out and about. Just don’t forget to secure the lid before shaking! Sturdy and well made. Will last a good while before needing to replace. I would recommend this shaker bottle to everyone. A must have accessory in everyone’s cupboard! ! Compact enough for work bag and the metal spiral adds air, and thus froth which is nice. Only consideration is to be certain the lid is screwed on fully and the cap is fully clicked down. Once fully closed it will be absolutely fine in your bag, if you don’t hear a discernible click from the cap it will leak.